Long before he was G. Love, Garrett Dutton crafted his signature sound on the front porch of his family’s Shore house. Garrett “G. Love” Dutton and his band, G. Love and Special Sauce, have been a presence on the music scene for almost 20 years, bringing his combination of hip-hop and “front porch” beach blues to stages across the world, touring with artists like Jack Johnson and the Dave Matthews Band. But it’s his local roots that have made him a permanent fixture on the Delaware Valley music scene. His music pays tribute to his Philadelphia-Jersey Shore roots, with songs like “I-76” and his album Philadelphonic serving as a nod to his Society Hill start. We caught up with G. Love in anticipation of his Dec. 30 appearance at the Borgata to discuss his Jersey Shore memories, inspiration, and the city where it all began. SOUTH JERSEY MAGAZINE: You’ve earned a reputation amongst local surfers. Do your surfing roots stem from the Jersey Shore? 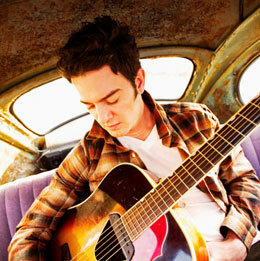 G. LOVE: I grew up every summer down in Avalon, and then my parents moved down there full time. I have a lot friends and family right there and a lot of my songs were written on my front porch at the Jersey Shore. SJM: What are some of your favorite memories of the Shore? G.L. : It’s a small, tight-knit community. Growing up, I loved all the aspects of the Shore, from surfing to fishing, and being in the water, and just enjoying being there with my friends and family. Once you get up over the causeway and smell that salt air, all the stress just goes away. And that’s what was so special when I was making music. From ages 15 to 25, I spent a lot of time, whenever there were no waves, just sitting on their front porch for hours and hours writing music. SJM: Do any favorite spots or stories come to mind? G.L. : This one summer, the summer I had graduated high school, I had broken my leg and I was a little laid up. So I would just sit on the porch every day, and I was just 18 and getting really heavy into my music and thinking about really making it happen. That was all right there. The mailman would come by every day and he would say ‘It sounds good!’ and all the surfers would come by to chill, and then at nighttime, I had these two neighbors across the street and they would go out at 10 o’clock at night and they’d get on their bikes and go over to the Princeton and they’d come back at 2 a.m. and I’d still be there sitting on the porch. It was simple, good times. SJM: What can we find you listening to now that you wouldn’t have back at your start? G.L. : I’ve always had a wide variety. I just like good music. It can be bluegrass or hip-hop, Johnny Cash or Bob Marley, or even Willy Nelson. I listen to a lot of blues and old rock and roll at home on vinyl, and when I’m on the road I listen to hip-hop like Wu-Tang Clan when I’m working out or on a run. And everybody that you play with and tour with turn things into a compilation for me. SJM: How has that changed your own music? G.L. : It’s changed so much over the years. You can’t help it. I’m like a sponge: Whatever I’m listening to or watching or whoever I’m touring with really has a huge influence on me. Whether its Dave Matthews or Run DMC, I learn different things from everybody. I learn new things that work on stage and things that don’t work on stage. SJM: With almost two decades of touring under your belt, how do you stay inspired? G.L. : The main thing I try and do is keep myself as original as possible. I think a lot of people can fall into that trap, giving so much respect for other musicians that you try to do what they do and chase their sound. But you have to realize that you’re where you are because you did something original. You’ve got to always be you; don’t chase what other people are doing. I feel like right now I’m in a good place with that. It’s not that I don’t care, but I’ve been around for a minute. I’m just myself and I can do my thing, and I’ve got my unique sound right now that’s true to what I am right now. SJM: How often do you make it back home? G.L. : I miss Philly a lot and nowadays I don’t get back a lot unless I’m playing. So coming back is always like a real big homecoming, but playing can be a tough thing. Ultimately, you want to put on a great show and not get caught up in who’s watching you, and when my family and friends are around, it can be a different experience. Still, it’s always a special show. There’s always that emotion from coming home. People are excited because they know just what I’m talking about. When I’m on the East Coast, the fans know exactly what I’m talking about. SJM: How did you find your balance between mellow music and soul? G.L. : I had that vibe from Jersey music, but I was born and raised in Philadelphia and grew up in a real urban area, and that was the other side. I was exposed to every different kind of person from every walk of life. At an early age, we really got into things like most city kids, like skateboarding and hip-hop and basketball and breakdancing. So one side of me had this front-porch kind of vibe and then I had the hip-hop influence and that’s where my style came from, directly. SJM: What are you looking forward to the most when you get back to Atlantic City this month? G.L. : It will be the holidays so it will be great to see some family and friends and put on a great show back at the Borgata. I hope that everybody down at the Jersey Shore can get back on their feet as soon as possible. I’ve been really pulling for everybody down there. Hopefully when I get in there, we can swoop in and bring them a party. Published (and copyrighted) in South Jersey Magazine, Volume 9, Issue 9 (December, 2012).